Home Spotlight on Teaching Teaching Buddhism, Teaching Otherness? 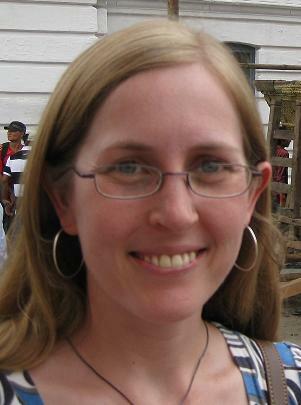 Anne Mocko is a PhD candidate at the University of Chicago Divinity School, specializing in the history of religions. In addition to teaching at the University of Chicago Divinity School, Mocko has also taught at the University of Chicago humanities core as a course instructor and writing instructor. Mocko is working on finishing her dissertation, Demoting Vishnu: Ritual, Politics, and the Unmaking of Nepal’s Monarchy, which documents the remarkable roles ritual has played in Nepal’s recent political transitions as the country has moved from a Hindu monarchy to a secular republic. Her most recent publications include “Ritual Replacement and the Unmaking of Monarchy” (In Ritual Innovation in South Asian Traditions, edited by Pennington and Allocco, forthcoming from the State University of New York Press) and “On Tree Marriage and Encountering the Rituals of Others,” featured on the University of Chicago’s Religion and Culture Web Forum. Buddhism — the “Familiar Other”? I was given the opportunity in the spring of this year to teach a course on Buddhism at the University of Illinois, Chicago. Initially I presumed that I was primarily being asked to design an exercise in familiarization — to make traditions that were unfamiliar to students become familiar — because I assumed that I would be introducing Asian traditions to a class predominantly composed of Anglo-Protestant students. However, I did not assume that Buddhism would be utterly foreign to these hypothetical students. After all, Buddhism has been something of an exotic pet for Protestant Americans (and Europeans) since the nineteenth century (Thomas A. Tweed; Philip C. Almond) and so I assumed that students entering my class would already have some passing familiarity with Buddhist traditions in some form or another. Indeed, they might already be quite taken with a highly romanticized view of Buddhism. Since I imagined that Buddhism would be a “familiar other” to my students, I decided to try to structure my course in a slightly more complex way, rather than simply introducing an unfamiliar thing. I decided instead to simultaneously introduce Buddhist terms, practices, and concepts and problematize the ideas of Buddhism they were likely to have encountered in popular representations; in other words to challenge the basic ideas I presumed they would “know” — that “Buddhism is a philosophy not a religion,” that “Buddhism has no gods,” and so forth. I began this program of balancing familiarity and unfamiliarity by titling my course “Many Buddhisms,” inspired by the challenge issued by Don Lopez in his introduction to The Story of Buddhism: A Concise Guide to Its History and Teachings (HarperCollins, 2001). Right from the start, then, I hoped that students would consider the ostensible object of our study — Buddhism — to be something of a moving target, something plural, various, and surprising. In preparing my syllabus, I primarily designed the topics and readings in conversation with, but largely in opposition to, the “Introduction to Buddhism” course which I myself had been in over a decade ago as an undergraduate, and which had first introduced me to the subject. Where my own introduction to Buddhism had primarily involved philosophical debates and texts, I wanted to introduce my own students to rituals, devotional traditions, and chanting. I wanted to give these students, as best as I could, a taste of embodied, lived Buddhist cultures that were a revelation to me when I began traveling to Japan and then to Nepal. In large part I used traditional classroom techniques in my quest to convey “Buddhisms” as lived practices. I assigned readings that not only laid out the historical development of various Buddhist movements, but also detailed monastic education practices in Tibet, analyzed stupa-building in ancient India, discussed gendered religious vocations in Thailand, and presented self-burning and self-burial practices in China and Japan. I played the students audio recordings of Sri Lankan monks taking refuge, Tibetan monks reciting liturgical texts, and Pure Land Buddhists calling on Amida Buddha. I tried to show video footage of Buddhists in action at least once a week, including video material I had shot myself at a Newar Buddhist baha in Nepal. It also turns out that YouTube has a remarkably large number of videos taken in various parts of Buddhist Asia.